Definition at line 44 of file forward.h. Referenced by aclParseAclList(), Security::PeerConnector::initialize(), and Security::PeerConnector::sslCrtvdCheckForErrors(). Definition at line 40 of file forward.h. 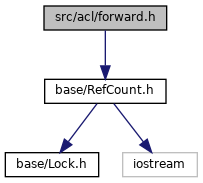 Referenced by ACL::context(), and ACL::ParseAclLine().